Geographic Information System (GIS) technology leverages the capacity of geographical data to address social, economic, business, and environmental issues at local, regional, national, and global scales. 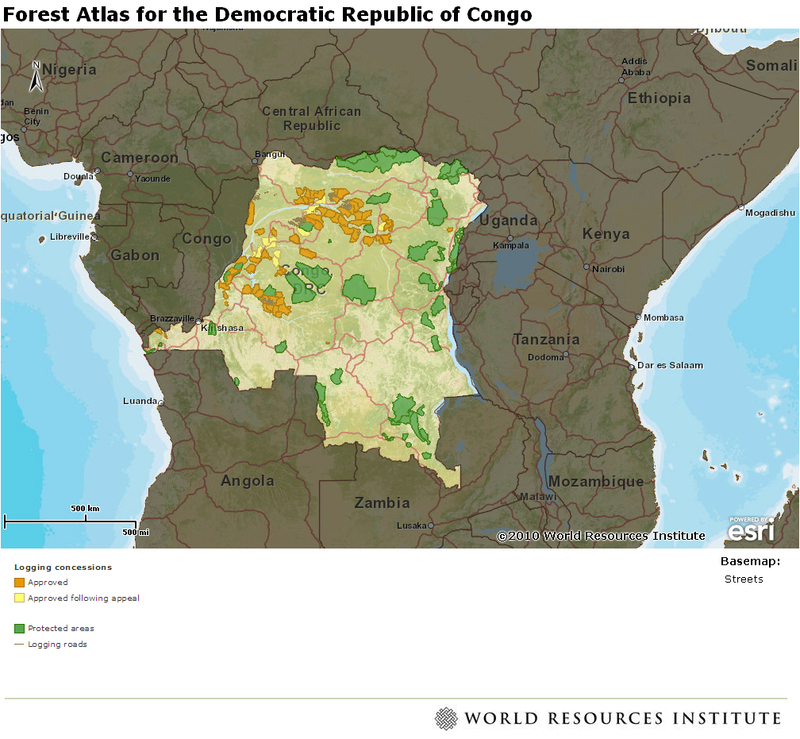 The World Resources Institute has recently published on its website an interactive map viewer featuring data on roads, logging and mining concessions, protected areas and detailed forest change in the Democratic Republic of Congo. This pilot project is extremely interesting as it represent a new way to promote worldwide public awareness on problems of preservation and sustainable development of the environment in developing countries. 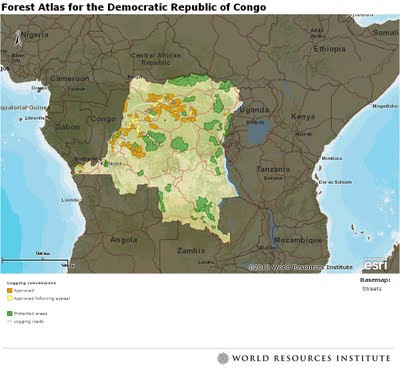 Above you can see a small map with the main information on the status and exploitation of forests in the Democratic Republic of Congo. On the World Resources Institute you can visit the interactive map, developed in collaboration with ESRI, which provides more comprehensive information. In September 2008, development partners came together for the Third High Level forum in Ghana. At Accra, donors and partner country governments recognised that strengthening national ownership of development required a wider dialogue that fully includes parliaments, local authorities and civil society organisations as well as south-south cooperation. Predictability. Donors provide, when possible, 3- to -5 year estimates of their planned aid. Country systems. Partner countries strengthen their capacities; developing country systems are used to deliver aid as the first option. Conditionality. Donors switch from prescriptive conditions about how and when aid money is spent to conditions based on the developing country’s own development objectives. Untying. Donors relax restrictions that prevent developing countries from buying the goods and services they need from whomever and wherever they can get the best quality at the lowest price. Ministers from across the globe, from both developing and donor countries, government representatives, parliamentarians, civil society organisations and private sector representatives will convene for the Fourth High-Level Forum on Aid Effectiveness at the Bexco convention centre in Busan, Korea, from 29 November to 1 December 2011. Approximately 2000 delegates will review global progress in improving the impact and value for money of development aid and make new commitments to further ensure that aid helps reduce poverty and supports progress in meeting the Millennium Development Goals. At the end of the proceedings, will be publish the Busan Outcome Document to further enhance efforts globally and within countries to make aid more effective in reducing poverty and achieving the Millennium Development Goals. 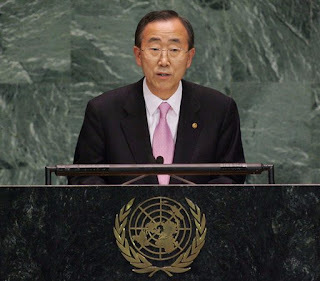 The United Nations General Assembly on 21 June 2011 reappointed U.N. Secretary-General Ban Ki-moon to another term that will run from Jan. 1, 2012, to Dec. 31, 2016. The appointment follows last week’s U.N. Security Council recommendation that endorses a second term for Ban, the eighth person to serve as secretary-general of the global body after succeeding Kofi Annan in 2007. European Union leaders were quick to congratulate Ban. 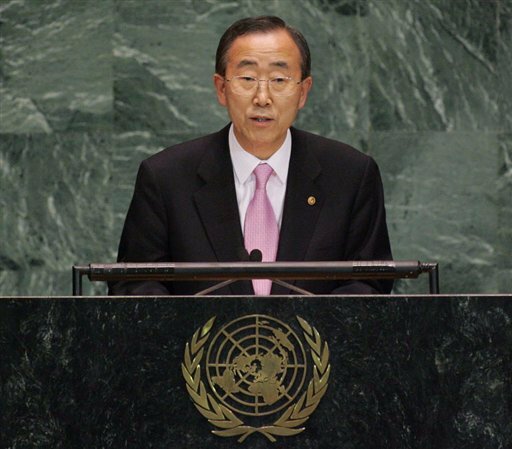 “Since becoming High Representative, I have developed a very close relationship with Ban Ki-moon. We are both firm believers that global problems call for multilateral solutions. He knows that in all three pillars of the UN’s work (security, development and human rights), he can count on the European Union’s support,” said EU High Representative for Foreign and Security Policy and European Commission Vice President Catherine Ashton in a press release. “Under his leadership the UN has played a decisive role in tackling issues of global nature from tackling climate change to peace and security, development and eradication of poverty. We look forward to continue the good cooperation between the European Union and the United Nations in the future,” they said.In a joint statement, European Council President Herman Van Rompuy and European Commission President Jose Manuel Barroso welcomed Ban’s second term. Ban has received strong criticism from the Office of Internal Oversight Services (OIOS), the UN internal audit unit, stating that the secretariat, under Ban's leadership, is "drifting into irrelevance"
For Anwarul Chowdhury, a former U.N. undersecretary-general and high representative, as well as a former U.N. Security Council president, earlier criticized as “opaque” and “non-democratic” the U.N. Security Council’s recommendation that Ban be given a second term. An International Convention to Combat Desertification in those countries experiencing serious drought and/or desertification, particularly in Africa, was adopted on 17 June 1994, and opened for signature on 14 October 1994. On 19 December 1994, the United Nations General Assembly proclaimed the 17 june the World Day to Combat Desertification and Drought by resolution 49/115. States were invited to devote the World Day to promoting public awareness of the need for international cooperation to combat desertification and the effects of drought, and on the implementation of the United Nations Convention to Combat Desertification. In 2011, the year celebrating Forests, the event has a particular meaning. A video of 12 minutes has been created to promote public awareness about the strict simbyosis between forests and drylands. in Niger the military junta, that one year ago have overthrown former President Mamadou Tandja, last March helped organise the presidential election. Voters had to choose between opposition leader Mahamadou Issoufou and Mr Tandja's ally Seini Oumarou. 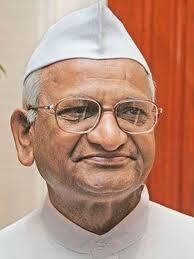 Mr Tandja had spent 10 years in power, but was overthrown when he tried to overstay his legal term limit. The army, which has pledged to step down by April, said it was not backing either candidate and would serve whichever government the people chose. General Salou Djibo, who has led the junta since its largely popular coup, called Saturday a "great day for me and for all Nigeriens". 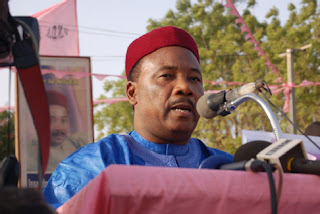 The leader of the opposition party Mahamadou Issoufou has been elected president. The European Commissioner for Development Andris Piebalgs said that the European Union is fully resuming its development cooperation with Niger in light of the country’s successful democratic transition and return to constitutional order following the election of last March. 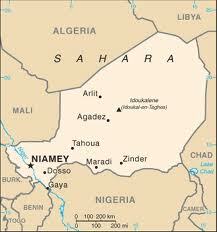 New programs for an amount of €87 million ($124.35 million) will be implemented in the country. First celebrated in 2001, World Refugee Day is held every year on June 20. The annual commemoration is usually marked by a variety of events in more than 100 countries, involving government officials, humanitarian aid workers, celebrities, civilians and the forcibly displaced themselves. 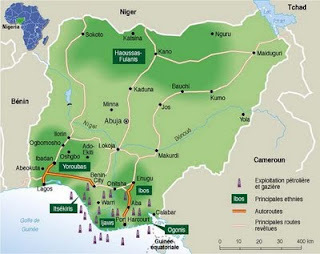 The event is particularly important this year as it falls in a year marked by the number of revolts, conflicts and repressions taking place in North Africa and the Middle East Region as well as in Cote d'Ivoire forcing a lot of people to leave their houses, jobs and countries of origins looking for help and assistance on the north shores of the Mediterranean Sea. The reaction of the EU member states seemed inadequate and highlighted national self-interests and the need for a more organic response at regional and international level. For more information on this subject I suggest to visit the site of the Refugee Studies Centre, the research center founded in 1982 as part of the Oxford Department of International Development (Queen Elizabeth House) at the University of Oxford. Illegal logging hazards protected species and favours landslides and floodings in villages located in the forests. It is not only important to enforce specific measures in the affected countries like Indonesia, Philippines, Madagascar or Papa New Guinea, but also to adopt adequate legislation in those countries where the logs are exported. The United States (Lacey Act) and the European Union (FLEG Regulation, EU Timber Regulation) have already adopted and amended specific legislation. 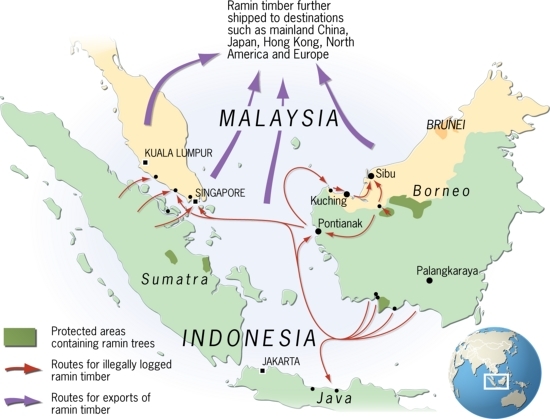 Routes for exports of illegally logged ramin timber in Indonesia. (2007). What it is interesting about the current Bill under discussion in the Australian Senate is the fact that big corporations, like IKEA, and environment groups, like WWF and Greenpeace, are forming an alliance in an attempt to urge the Australian government to crack down on illegal logging and follow the so called common platform (a set of recommendations to help governments adopt effective legislation). Anna Hazare is one of the leading activists of the anti corruption campaign supported by civil society organizations in India. The issue of corruption has been always at the center of the political agenda In India but with government unable or unwilling to curb corruption, gurus and activists are struggling to clean up India's public life. The country registered in the last years high economic growth rate but without adopting anti corruption legislation how India could develop further? In the past years subsequent government-drafted Lokpal Bills (Hindi: जन लोकपाल विधेयक) (also referred to as the citizens' ombudsman bill), a draft anti-corruption law, have failed to pass through the Rajya Sabha, the upper house of the Parliament of India. The Bill drafted by Shanti Bhushan, retired Indian Police Service officer Kiran Bedi, Justice N. Santosh Hegde, advocate Prashant Bhushan, former chief election commissioner J. M. Lyngdoh in consultation with the leaders of the India Against Corruption movement and civil society, proposes the institution of the office of Lokpal (Ombudsman) at the center and local Lokayukta at the state level. The entry into force of this Bill would create an independent body similar to the Election Commission with the power to prosecute politicians and bureaucrats without prior government permission.The bill is designed to create an effective anti-corruption and grievance redressal system that effectively deters corruption while providing effective protection to whistleblowers. 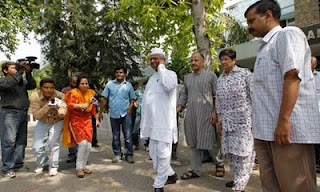 Hazare's supporters held in the last months a rally in the national capital and demanded quick passage of Jan Lokpal Bill. Similar rallies were also held in more than 20 cities including Mumbai, Pune, Lucknow, Kanpur, Indore, Silchar, Jaipur, Moradabad, Raipur, Hyderabad, Bangalore, Chennai, Chandigarh, Hojai (Assam), Kanyakumari, Thiruvananthapuram and Vishakapatnam. Prime Minister Manmohan Singh stated that the Lokpal Bill would be introduced in the 2011 monsoon session of parliament. However in the last week end Indian police have used teargas and batons to break up a mass anti-corruption protest led by India's most famous yoga guru and political activist Swami Ramdev and Harare decided to meet with his followers at a memorial to Mahatma Gandhi in New Delhi and hold a day-long hunger strike against corruption to warn the government. Hundreds of millions of children throughout the world are forced to work and their rights to adequate education, health, leisure and basic freedoms are violated. Of these children, more than half are exposed to the worst forms of child labour such as work in hazardous environments, slavery, or other forms of forced labour and illicit activities such as drug trafficking and prostitution, as well as involvement in armed conflict. The International Labour Organization (ILO) launched the first World Day Against Child Labour in 2002. The day, which is observed on June 12th, is intended to serve as a catalyst for the growing worldwide movement against child labour, reflected in the huge number of ratifications of ILO Convention No. 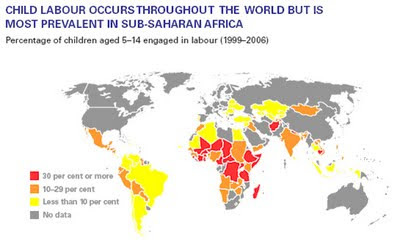 182 on the worst forms of child labour and ILO Convention No. 138 on the minimum age for employment. 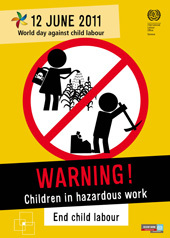 In 2011 the day will be dedicated to those children involved in hazardous work. According to ILO’s most recent global estimate around 115 million are illegally involved in hazardous work. This is work that by its nature or the circumstances in which it is carried out, is likely to harm children’s health, safety or morals. Children working in many different industries and occupations can be exposed to such risks and the problem is global, affecting industrialised as well as developing countries. It seems more and more evident that the Bill under discussion in the current presidency tenure will not enter into force in this session. Both the proceedings in the House of Representatives and the Senate of the National Assembly are very slow at dealing with the votations for the articles in the text. 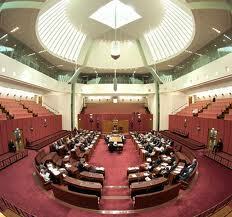 The interests of international companies and local politicians are slowing down the entry into force of the Bill. 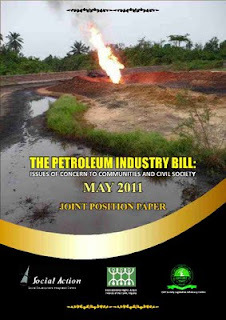 Furthermore, civil society organizations like Social Action are saying that they will mobilise Nigerians to resist the passage of any version of the Petroleum Industry Bill, which fails to address local concerns.